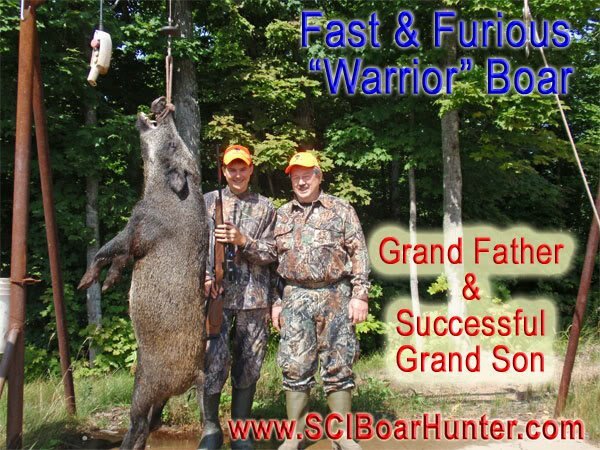 This Authentic Hunting Adventure is for the Hunter who has always dreamed of pursuing and slaying a genuine Boar, but does not want to travel out of the United States to hunt in a third world nation. 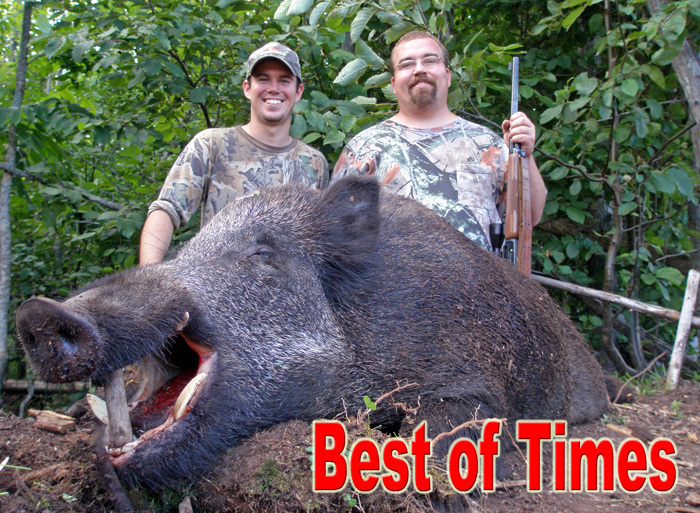 Stay in the comfort and security of the USA and save time & money to hunt Bear Mountain Boar. My Name is Greg Johnson, friends call me the Moose Man, and I have recreated an Authentic Boar Hunting Adventure at Bear Mountain. When you enter the Great Northern Forest you will discover the Boar’s Native Habitat and Natural Environment. It is here you will enter his lair and encounter this primordial Beast of Prey. Hunting at Bear Mountain is a unique and special adventure because You will Hunt in the Heart of the North American Wilderness located in Upper Michigan and will be just a few miles from the Shore of Lake Superior, the worlds largest Fresh Water Lake. Do to the sheer size of the “Big Lake”, Lake Superior is the Major Climatic Factor that creates this Unique Hunting Adventure unlike any other in of North America. Morning at the edge of the Forest is a great place to ambush Boar. Many of the Bigger Boars are less cautious while returning to their Lair after a night of fighting, feeding and fooling around with the receptive sows. 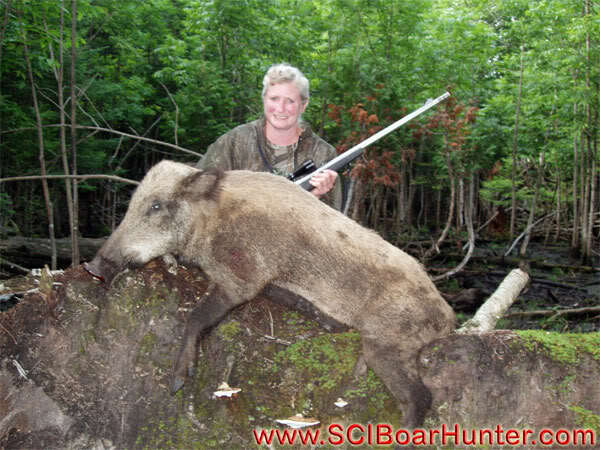 Much of the Boars position in the Herd is maintain by being overly aggressive, so caution plays into your hunt. Cruising deep into the center of Bear Mountain you enter the lowlands areas which are compose primarily of evergreens including Black Spruce, Cedar, Balsam Fir and tag alders. Many of the shots are up close and personal. It is critical to have the plenty of stopping power when encountering the beast on his own turf. You may bring your own Weapon, or choose one from the Bear Mountain Vault! 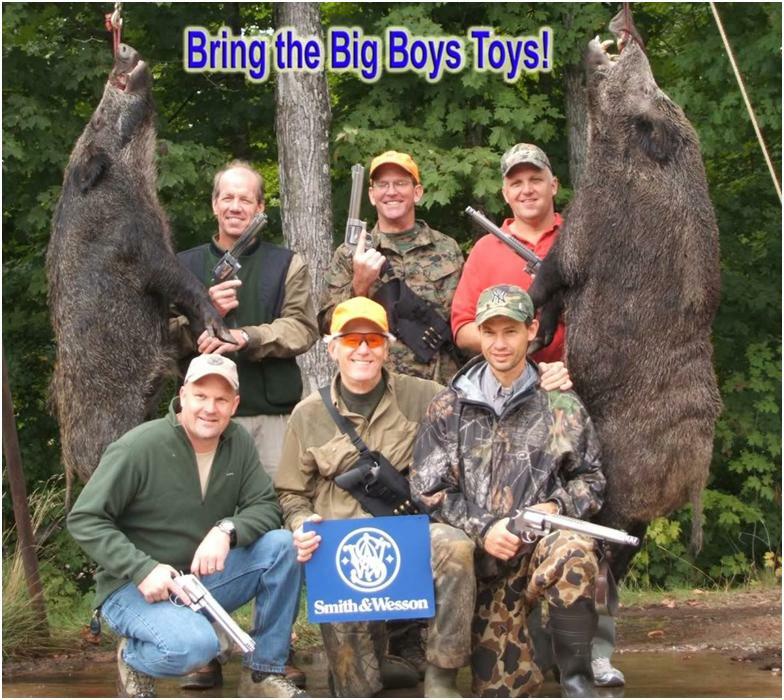 Bow Hunters are the real Killers – Guns are to easy! Your Guides will work with you to set up different Hunting Scenarios based on your personal interests and desires, the size of your Hunt team, the experience levels, and everyone’s physical capabilities. All ages are welcome! Hunting Styles depend on your preferences. There is nothing more impressive then a Trophy Pole hanging high with the days HarvestIt is especially satisfying when you Hunt the Beast on your own terms. Boar inhabit the Northern most reaches of Europe and Asia. These “Ice Age” Beasts have the thick shaggy coats with long guard hairs combining with a dense wool under coat giving them that prehistoric look. True Tanks of the North, the Boar is High Game throughout Europe, but You can now Hunt this Beast in the United States, here at Bear Mountain Lodge. There is a Hunt for anyone’s Skill Level and Budget. 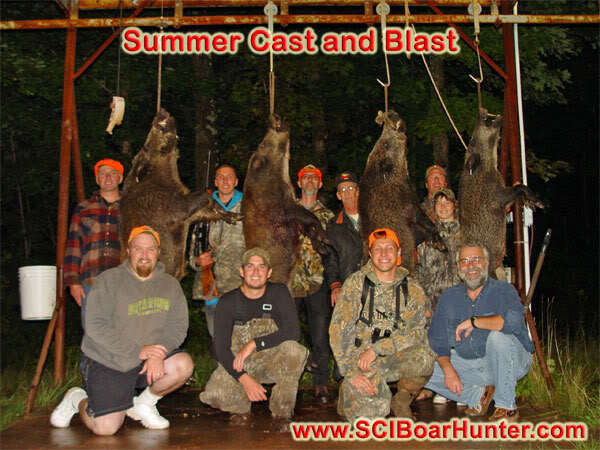 From the advance Collect to the First time Hunter, Bear Mountain LLC welcomes you to come and experience an Authentic Boar Hunting Adventure. Luxury Restaurants around the World Offer “Wild Boar” as top billing on their Menus. Lean Red Meat that is Healthy for You. Now You can Create Your own Gourmet Dining by Harvesting one of the “Contender” Boars. Invite your friends and family over for the Grilling and Thrilling as you tell one story after another of how you survived your adventures into the Great White North. These Delightfully Young Pigs are the most tender, succulent, delicacy in the forest. Many of our successful Guest take an additional Contender Boar just for the fine eating qualities of the Meat. Tender lean red meat that makes Wild Boar world renowned for fine dining in upscale restaurants. Then all you pay is for your meals and lodging at Bear Mountain LLC. I am confident that you will enjoy your hunting adventure and that you will become a champion for Bear Mountain LLC. You will earn the right to tell your friends and family about your Fun (bravery and courage) and all the great experiences you have had at Bear Mountain LLC.